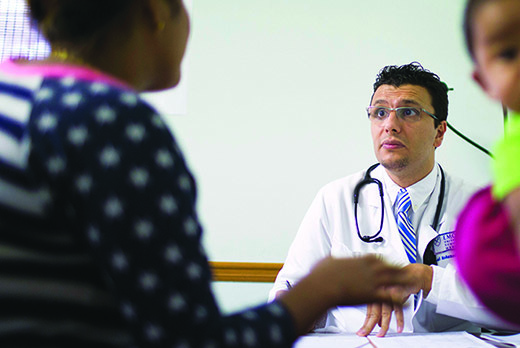 Former Syrian refugee Dr. Heval Mohamed Kelli is an Emory resident whose patient care helps immigrants in his old neighborhood in Clarkston, Georgia, and his research connects them to better heart health. In fiscal year 2015-2016, Emory Healthcare provided $72.3 million in charity care. "Charity care" includes indigent care for patients with no health insurance, not even Medicaid or Medicare, and no resources of their own. It also includes catastrophic care for patients who may have some coverage but for whom health care bills are so large relative to their financial situation that paying them would be permanently life-shattering. In addition to charity care, Emory Healthcare provides many other services to help improve access to care, advance medical knowledge, and relieve or reduce dependence on taxpayer-funded community efforts. In fiscal year 2015-2016, this total for Emory Healthcare was $52,538,139. The stories of patients who benefitted from such charity care, and the ways Emory Healthcare facilities benefit the Metro Atlanta community, are highlighted in the newly published Community Benefits Report 2016. Caring All the Time: Eight Days a Week covers the impact of the entire Woodruff Health Sciences Center, which includes not only Emory Healthcare, but Emory School of Medicine, Rollins School of Public Health, Nell Hodgson Woodruff School of Nursing, Yerkes National Primate Research Center, Winship Cancer Institute, and a large presence at Grady Memorial Hospital, Atlanta VA Medical Center, and Children's Healthcare of Atlanta.